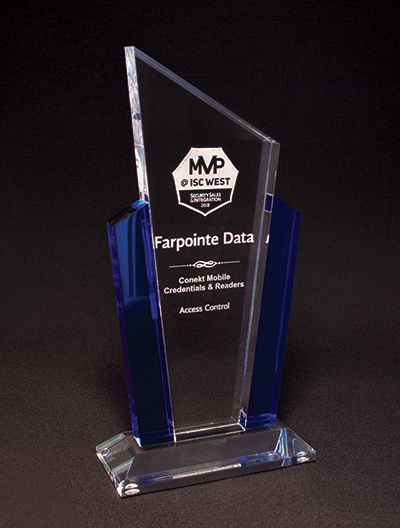 Sunnyvale, Calif., USA - May 1, 2018 – Farpointe Data, the access control industry's OEM for RFID credentials and readers, today announced that one of the most prestigious security channel publications in the American market, Security Sales & Integration, recently honored Farpointe's new Contekt mobile credentials and reader system. According to Senior Editor Rodney Bosch, "the company was selected a Most Valuable Product (MVP) Award winner in the Access Control category. Those awards were officially announced at the SAMMY Awards during ISC West and will be featured in the June publication." The new product system was introduced at ISC West in April. According to the publication, "access control system manufacturers, integrators and dealers will be able to provide their customers with a mobile, smart phone application and hardware that provides free download, user's choice of smart phone or smart card, and distribution via existing or independent access control software. Multiple Conekt credentials can fit into a single smart phone wallet app." Since mobile access control credentials were first introduced, channel customers have requested a mobile, smart phone solution that eliminates so many of the frustrations that they have discovered with the original smart phone apps and hardware. The 2nd-generation Conekt solution provides the easiest way to distribute credentials with features that allow the user to register only once, needing no other portal accounts or activation features. By removing these and additional information disclosures, Conekt eliminates such cumbersome procedures and their resulting privacy concerns that have been slowing down adoption of mobile technology. Multiple Conekt credentials can fit into a single smart phone wallet app. Installer adjustable read ranges can be more than 15 feet (4.5 m). There are no physical cards to order, ship or store, making credential distribution much easier. With this app and products, channel customers can more straightforwardly enhance existing installations. With its core compliant to the Certified Common Criteria EAS5+ Computer Interface Standard, the Conekt solution provides increased hardware cybersecurity to resist skimming, eavesdropping and replay attacks. Leveraging the Security Industry Association's (SIA) Open Supervised Device Protocol (OSDP), Farpointe's Conekt solution interfaces easily with control panels or other security management systems, fostering interoperability among security devices.